So the name was BLUE MUG. When I told my friend that I was going to see a play by this name, her immediate reaction was - 'Of course I know why you're going. You love all things MUG', referring to my bizarre hobby of collecting mugs. Frankly speaking, my curiosity in the play was piqued primarily for this reason. Plus it boasted of a rocking star cast - Konkona Sen Sharma, Vinay Pathak, Rajat Kapoor, Sheeba Chadha and Munish Bhardwaj. Plus, I was going to go watch a play after sooooooooooooooo long. Plus, it was term 8, time to start living up whatever little Hyderabad has to offer - no offence, but Hyd is small compared to Maximum City. So there we went to watch the BLUE MUG. Unfortunately, the title words make an appearance all of thrice throughout the play. And right at the start, they said that they have no props. 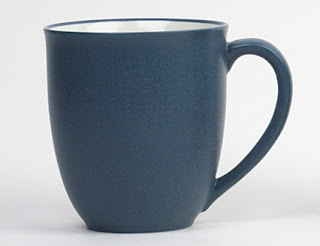 So there went all my hopes of seeing a blue mug. Secretly I was hoping to get tiny blue mugs along with our tickets, as an ad gimmick - call it wishful thinking, but what else can you expect out of a mug collector? So, anyway, no freebie blue mug, no props, so no real life blue mug. I went running from a class, straight to the play, so no mug of coffee either. Although after reaching the venue, I was made to wait in a serpentine line to enter the air conditioned, mosquito-free part of the audi, before crowding up to enter the actual theater, which we entered after almost an hour! But since I was with my gang, it never really hurt. Plus I was too busy displaying my histrionics, for who knows where I could be 'the new find of 2010'???? Then the play started. The audi was good, albeit a tad cold. The artistes were awesome. Their lines were perfect, the lights were perfect. But in an attempt to tie the whole play to a theme around memories, according to me, something was lost. Ok, I am not a theater afficionado, but I appreciate art and entertainment. Note to self - visit Prithvi and Rangsharda more often, so I have more entities in my consideration set. (Did I just say consideration set???) Anyway. The play certainly had its moments. At some places, like in Ranvir's portrayal of a Punjabi with a 15 minute memory, the humor was strong, and at some places, rather contrived. The play, according to me could not be classified as either serious or humorous, and I prefer silos, so that I can make up my mind whether to come out smiling or reflective. Sheeba Chadha is an amazing artiste. But her parts were motley to say the least. Glass pieces, to Saharanpur to suddenly Babri Masjid? Yeah, seemed just like the movie Page 3 that aspired to cover all aspects from drug addiction, to paedophilia, to riots to what not! Again, Koko according to me was wasted. Her talent certainly deserves more depth in terms of character. There some portions, like the five petal leaf part, which my little brain didn't quite get the relevance of. So, part serious, part humorous, somewhere frightfully deep, and somewhere ridiculously banal, this play should rather have been called motley or scrapbook or collage! It certainly had its moments and the talent was amazing, and in terms of portraying a theme around memories - their variety and the emptiness of a life without memories was well portrayed. For me, though, it was another tryst with art, theater after a long time, exercise for the right side of my brain, and yet another topic to blog about.